Students will learn to identify initial consonant sounds and the letters that represent those sounds. Students will indicate awareness of consonant sounds and letters by responding with a physical movement. As students transition from phonemic awareness to phonological awareness, they acquire an important skill: the ability to convert sounds that are heard into the letters that represent those sounds. We begin the process of teaching letter/sound relationships with the consonants since they are more predictable than the vowels. For example, the consonant letter b nearly always represents the beginning sound in the word ball, whereas the vowel letter a can be short (cat), long (made), or neither (ball). The auditory discrimination that students develop in preschool years or kindergarten prepares them for decoding and spelling words through phonics. This lesson plan uses music, rhythm, and play activities to encourage students to identify the beginning letter in words that they hear. Each time two words are sung in the question parts of the song, students respond by naming the initial consonant and by pointing to that letter on the charts, reinforcing the concept by including more of the total body in the learning experience. One way of singing the song in this lesson is to cover the box containing the letters at the bottom of each Mini-Chart page until the students have identified them. In this way, the song Who Knows the Letter? becomes a kind of guessing game with clues, giving students the feeling that they are playing, rather than learning. It should be stressed that, at this stage of development letter/sound matching is both an auditory skill and a visual one. 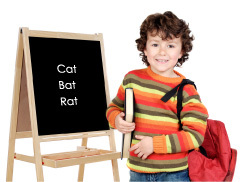 In other words, students can not only name the letters that begin each target set of words, they also identify those letters in both capital and lower-case forms. However, most students at this level do not generally have the skill level to read or spell all the words in the song. For students who can already read some simple words, song lyrics on the Mini-Charts can help build additional skills in spelling and reading. This lesson is the fifth in a series of five phonemic awareness lessons. The previous lesson, Kindergarten Phonics Phonemic Awareness: Sounding Out Words, teaches students to blend onset and rime into words. Once students have mastered the phonemic awareness skills in these five lessons, they can proceed to more advanced skills dealing with letters and sounds in Sing Your Way Through Phonics Volume 1. Note: If you do not have the CD or Mini-Charts, you can still teach this letter sounds lesson plan using the folk tune listed on the Who Knows the Letter? Song Lyrics page. For this level, it is good practice to include pictures, for visual reinforcement. Say, “Today we are going to sing a song about letter sounds. First, let’s see if we recognize all the capital and lower-case letters we need for the song.” Play a Concentration or matching game using capital and lower-case letter cards or magnetic letters for Bb, Dd, Jj, Kk, Pp, Tt, Ss, Ff. For Concentration, mix up the cards and turn each of the letter cards face down. Allow a player to turn over two cards. The player must name the letter on each card. If capital/lower-case partners are turned over, the player keeps the cards and takes another turn. If overturned cards are not partners, cards are re-placed face down and the next player gets a turn. Play continues until all cards are matched. Player (or team) with the most matches wins. To play a matching game, scramble up the set of letter cards or magnetic letters. Students unscramble the letters by matching pairs of capital/lower-case letters. For added incentive, use a timer and have students try to beat their own or others’ completion time. Play Track 9 of Sing Your Way Through Phonics Ready to Read! CD, pointing to the pictures and the letter boxes on Mini-Chart pages 64-75. Say, “Now, let’s practice this song again, and we’ll give some of you a chance to cover and uncover the boxes of beginning letters.” Choose two students to stand to the left and right sides of the Mini-Charts. Each student covers the letter box on his/her side of the charts. Each student uncovers the picture after the phrase, “They both begin with ___.” Play CD Track 9 again and assist the letter box coverers, if necessary, by guiding their hands and reminding them to turn pages as the song continues. Cover each letter box with a small sticky note on Mini-Chart pages 64-67 and 70-73. Sing the song again, but this time let students lift the sticky note to reveal the beginning letters instead of removing their hands. Give a letter card used in Step 1 to each child. If necessary, make enough duplicate copies so that every student is holding a letter. Ask each student to identify the capital or lower-case letter s/he is holding. Practice singing Who Knows the Letter? every day for a week. Then try singing the song with the instrumental track on the CD (Track 10). Do the students remember all the words to the song? Review any parts of the song that are giving them difficulty and use the pictures on the Mini-Charts to aid memory. Help students create other sets of words for the song. Make 8 copies of Mini-Chart template page 88 and 2 copies of Mini-Chart templates pp. 89-91. At first, you might use only the consonants already in use, but change the pictures. Example: Replace boy and ball with bag and boat. Eventually, use the song to teach other initial consonants such as Gg (gorilla, gum), Hh (heart, hand), Ll (ladder, leaf), Mm (monkey, milk), Nn (nail, net), Qq (quilt, queen), Rr (rooster, rake), Vv (violin, vase), Ww (wagon, watch), Yy (yo-yo, yarn), and Zz (zebra, zipper). Pictures may be replaced with drawings, clip art, magazine cut-outs, or photos. Repeat Step 2 with several more picture cards, always giving students a choice of two different letters for their choice of beginning sound. At first, use only capital letters. Gradually add lower-case letters if students succeed in correctly naming the beginning letter for most of the pictures. Use the instrumental track of the song to create a themed song using describing words (ex. l=little and light, s=sunny and strong, b=bumpy and big), action words (ex. j=jump and jog, c=creep and crawl, r=run and reach, b=bend and bounce), animals (ex. b=bear and bee, d=deer and dog, f=fox and flea, l=lion and lamb). Students indicate ability to identify beginning consonants by correctly singing the beginning letters when the letter boxes in the song are covered.